My OMG (One Monthly Goal) for March was to finish up a couple of quilts for the kitty to use when she is curled up in the human’s chairs. I kept the quilting simple and it isn’t very tidy. I don’t think that will make a difference when these are washed. I also don’t think perfection matters to the kitty. Now all I have to do is to remember to remove kitty hair covered quilts before the humans have a seat! I am linking up with OMG at Elm Street Quilts. It will be fun and inspiring to visit the other bloggers who have linked up, and see what they were able to finish for March. Kathy, over at Sewing Etc., will be snickering after I announce my latest project. Kathy was looking for a new BOM to play with, and I snubbly said that I wasn’t going to fall into that trap. Famous last words and all that. While blog surfing (my mistake, I know), I came upon a QAL that I found irresistible. Partners in Design is offering a free QAL called Sew Lets Quilt. The first block is a sewing machine. You can see Snowy Days version here. The block was fun to make! I have a couple of embellishments to finish. The buttons are not attached, and I have marked where I want the thread to be embroidered. I am not embroidering the thread until I decide if I want to apply it by hand, or perhaps, machine quilt it later. The nine patch is a left over unit from making Bonnie Hunter’s On Ringo Lake mystery quilt. I think it fits well into this block! I have been enjoying lots of blogger posts brimming with excitement as their gardens come to life with crocus, snowdrops and daffodils. So…why not share a little stroll around my garden? I began this project in April 2018 with one of my granddaughters in mind. She will be receiving it for her birthday this year. I am very happy with the quilt, and I think she will be too! I know that you can’t see the quilting. It is quilted all over with bees. I used a cute bee pantograph from Urban Elementz. I also used the same fabrics that I used to piece Sugar Town…a birthday gift for the close cousin of this granddaughter. Since it was an OMG project, I posted updates here, here, here, here, and here. I know the cat lovers (there are a lot of us) will appreciate my goal for this month. I need some kitty quilts for my living room chairs (Or do they belong to the kitty?). She has her own beds (2 of them) and her own tower with another bed, but she would rather curl up in the chairs. I know that she likes a soft quilt, so it is past time to give her one or two of her own. There are several setting designs, depending upon how you turn the block. These quilts will be 24″ when finished. And that is the goal for March…to sandwich the tops, quilt them, and bind them. I am linking up with OMG at Elm Street Quilts. It will be fun and inspiring to visit the other bloggers who have linked up and see what they are working on. I have a new favorite fabric basket tutorial. Tessa Marie Walker calls her basket a thread catcher, but I made mine to hold bobbins and feet for my Juki (not pictured). The color isn’t great in these photos, but you get the idea. The tutorial uses canvas. I didn’t have any, so I used a leftover heavy fusible interfacing for my baskets. I also applied the binding by machine to the inside of the basket, and then turned it to the right side and machine stitched it down. The basket is a good size; it will hold quite a few fat quarters. The basket would be a very nice gift as well. Fill it with chocolate for instance! I will be making more of these in my future! You can find this tutorial at The Sewing Chick. It is time to share how I did with my February OMG. It is a great feeling to report that I accomplished the goal of quilting the Leavenworth quilt, and it is also bound and finished! I don’t like the border that I finished the quilt with…I think the corners overwhelm the quilt. However, it has grown on me since I washed and dried the quilt. I wish I took a photo of that because it now has wonderful texture! Finishing two large quilts (Sugar Town) in one month is a record for me! I really had to focus and manage my time, but it is worth it! The photos aren’t great, but they are proof of reaching the goal line! For more about this quilt, including lots of examples of virtual quilts made from the Leavenworth Nine Patch block, click here and here. 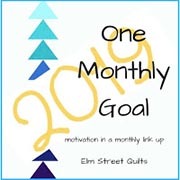 I am linking up with Elm Street Quilts OMG (One Monthly Goal). Click on the link to get inspired by more goal setters and their accomplishments!